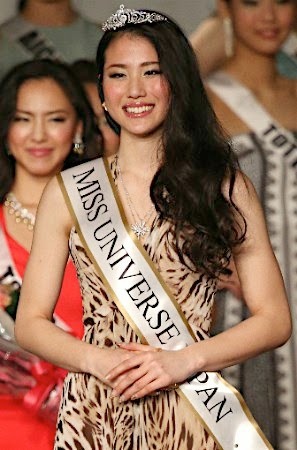 The new Miss Universe Japan is Miss Nagasaki, Keiko Tsuji. She is 20 years old and will represent Japan at the next Miss Universe Pageant. The first runner-up was Miss Tokyo, Hiromi Nishiuchi, and the second runner-up was Miss Fukushima, Misaki Takahashi. Miss Osaka, Anri Okane, finished in fourth place while Miss Ehimi, Madoka Hata, finished in fifth place. the last two winners of Miss Japan was disappointing choices to Miss Universe. At this rate it will be another 48 years before Japan wins their third Miss Universe crown! At first I was disappointed that Miss Nagasaki won, but she's starting to grown on me with her recent public appearances. Hopefully she will get a good training by MUJ and an extraordinary wardrobe for Miss Universe.